It is very important that you don’t neglect the warning signs that tell you it’s time to replace your water heater. Having warm water running through your house can often be taken for granted, but losing it for any amount of time can be a frustrating experience. That’s why it is so important that homeowners get regular maintenance done and replace their water heaters when necessary. Most of us rely on hot water in our daily lives, from bathing and laundry to cooking and washing the dishes. On average, most water heaters are built to last about a decade, and if they are well maintained, they may even last longer. This might seem obvious, but one of the most likely signs that it’s time for a water heater change is simply the water heaters age. 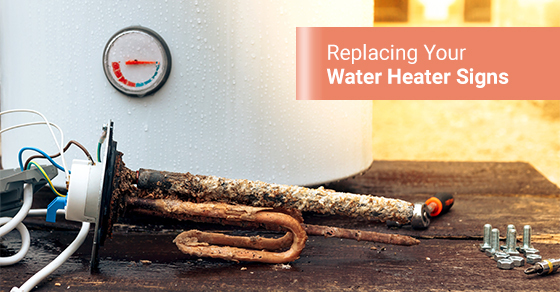 You should replace your water heater approximately every ten years. The serial number should indicate the age of the water heater, with most serial numbers using a letter followed by a series of numbers and can be found on the sticker label directly affixed onto the water heater. The first two numbers typically reflect the year the water heater was manufactured in. Check this number and decide if your water heater might need to be replaced because it is nearing or reached the ten-year mark. Water that looks rusty or has a red and brown tint to is never an appealing sight. Since metal is susceptible to rust after it has come into contact with water and oxygen over a long period of time, you can expect the metal on the inside of your water heater will develop rust as well. This may start to leave a rusty residue in your water. Once you see this, you know it’s probably time for a new water heater. At that point, it’s best to determine where the rust comes from so you can make an informed decision. The rust often comes from a rusty valve or rusty pipes. Find the source of the rust and determine whether it’s coming directly from the vital parts of a water heater. This is a primary indicator that your water heater is faulty. If your water is no longer being warmed to adequate temperatures, your water heater might very well need to be replaced. This also applies to situations where you aren't consistently getting warm water running from the taps. If you have been experiencing these warning signs and are looking to replace your water heater, contact one of our experts at Imagine Plumbing. Imagine Plumbing is home to some of the leading plumbers in the industry. Call us today at 844-397-2588 or contact us here for more information.